Signing you up to our newsletter! Stay up to date with everything Huddersfield Town with our newsletter. Where do you think Town will finish in the league this season? Huddersfield Town are a West Yorkshire based football club who currently play their home games at the John Smith's Stadium in Huddersfield. The club are nicknamed the Terriers, though they are sometimes referred to as HTFC, HTAFC or simply Town. Since Huddersfield Town were formed in 1908, many trophies have been won including the FA Cup and the Division One (now the Premiership) title three times in a row, a sequence which has only been equalled by Liverpool, Manchester United and Arsenal. The John Smith's Stadium - previously known as the Galpharm Stadium and the Alfred McAlpine Stadium - is a versatile sports, leisure and commercial complex located in Huddersfield, West Yorkshire and has been the home of Huddersfield Town Football Club since the 1994/95 season. The John Smith's Stadium is also the home of Huddersfield Giants RLFC. Huddersfield Town's home between 1908 and 1994 was Leeds Road. The Terriers experienced many highs and lows at the ground including the 1-0 defeat to Arsenal where a record 67,037 people watched on. Town's final game at the ground was a 2-1 win against Blackpool. You can read more about Huddersfield Town's stadium by clicking here. Terrier Bytes is a community-driven Huddersfield Town website made by the fans for the fans. We always aim to provide dedicated Town fans with ways to easily interact with each other, whether it be via our forums (The Cowshed), the Prediction League or through the comments facility present on each article. If you're a Huddersfield Town fan and would like to write for our site, please click here and fill out the simple form. 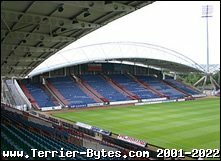 Terrier Bytes is a Huddersfield Town Football Club fan site built and maintained by dedicated Town fans, which is now in its 18th year online. The site provides fans with all the latest Huddersfield Town FC football news, match reports and lots more. Garfield is the webmaster and developer for the site with Sean Makin the lead content editor and moderator. Click here to read more about Terrier Bytes and its predecessor, HTAFC World.